Help your team close 20% more deals with this free guide. How to make your sales training stick. Many IT staffing companies lack a serious sales training program. And when they do have a training program, they have a hard time getting the methodologies adopted and consistently used by all their reps. Sales training matters. If you hire a rep, and they don't get up to speed and start closing deals, you have a problem: you need to find a new rep. The cost of replacing a new rep, based on Aberdeen Group research, is $29,000 and seven months. How do you create an effective sales training program, that has 100%, long-term adoption, that helps your reps (new and old) close more deals, faster? 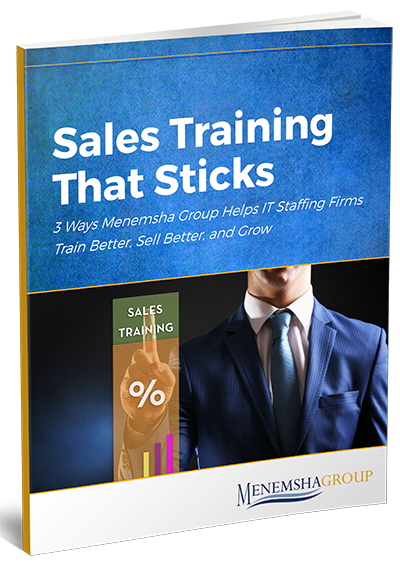 Menemsha Group has helped 300+ IT staffing firms, and we've learned a thing or three. The two main reasons that 85% of 300+ Menemsha clients struggle to close deals. About change management theory, and how it can help you. Key metrics you need to track to understand if your sales training is working. Just fill out the form, click the button, and check your inbox. Fill out this form to download this guide.